VANKLEEK HILL, ON – Beau’s All Natural Brewing has announced details for the sixth in its monthly series of collaborative beers being released as part of the brewery’s partnership with Ottawa 2017. As bee balm is one of the most immediately recognizable pollinating plants, Beau’s sourced organic essential bee balm oil from Quebec to use in Cross Pollination. 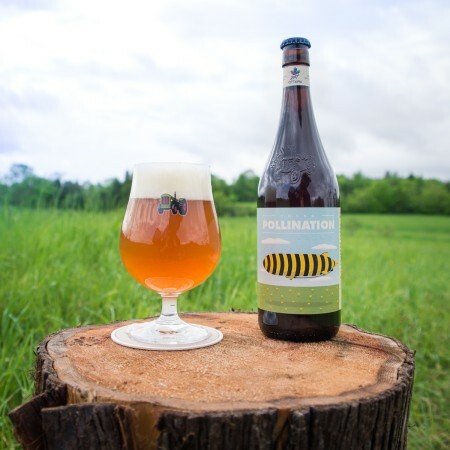 Along with organic honey, the bee balm lends sweet, floral notes to the beer’s aroma, characteristics that are complemented by the chosen style, a fruity and slightly peppery Belgian-style farmhouse ale. Cross Pollination pours hazy gold with a white foam and finishes clean, with wildflower reverberations. The use of traditional Belgian Saison yeast imparts a mild spice character to the beer. Cross Pollination is available starting today (June 1st) in 600 ml bottles at the Beau’s brewery store and BYBO delivery service, and on tap at select bars and restaurants in Ontario.